Many children around the world grew up watching poorly-dubbed Godzilla movies on sci-fi television networks. The movies are cheesy, childish, and often forgettable. However, in 2012, the Criterion Collection re-released the original 1954 Godzilla on blu-ray. This landmark film directed by Honda Ishiro is not silly like its sequels, but rather chilling. This re-release (coupled with the popularity of the 2014 Godzilla film from Legendary) inspired this illustration. 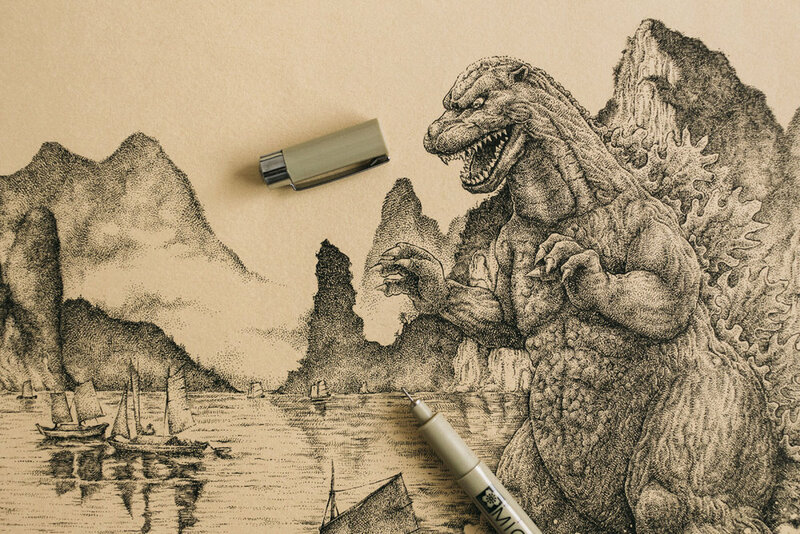 Here, Godzilla (Gojira) can be seen attacking some old fishing boats close to the shore. The Japanese calligraphy was among the first components to be completed, but after two years, it looked rather amateur, so it was redone separately, then added digitally.